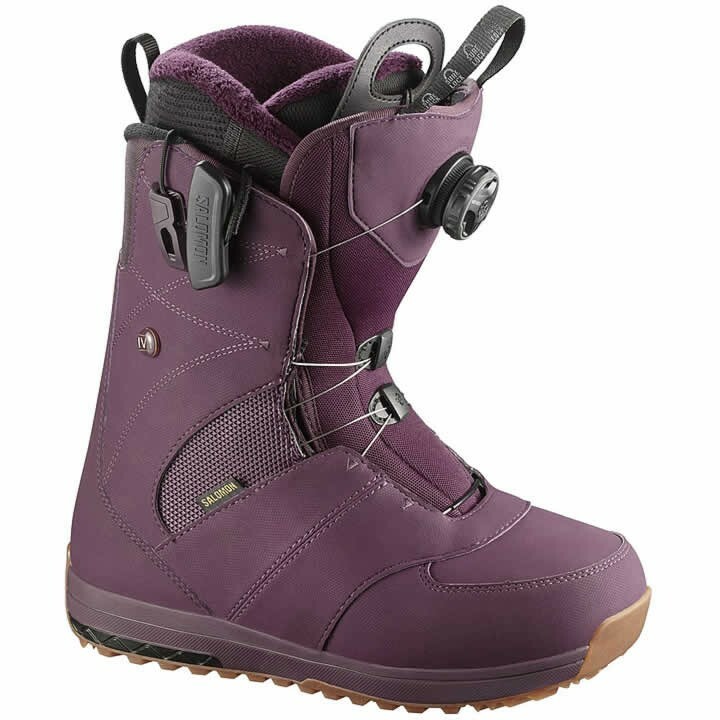 The Salomon Ivy Boa Snowboard Boot offers a boatload of comfort with Boa + STR8JKT for speedy lacing, supreme heel-hold, and response. STR8JKT is an additional inner heel harness that eliminates heel-lift and provides optimal comfort. Designed specifically for women the Diamond Liner is heat moldable featuring Custom Fit that guarantees best fit, softest touch, and extra warmth. Medium flex is more maneuverable and forgiving. Great for beginner/intermediate riders or for advanced riders who prefers a looser more skate like feel. Diamond: Designed specifically for women from the sole up. The Diamond Liner guarantees the best fit, softest touch and extra toasty warmth where women need it, providing all day warmth and comfort where women need it. Str8jkt: Lock your feet down with supreme comfort. STR8JKT models feature an additional heel harness for a no heel-lift ride and optimal comfort. The ergonomical strap is easy to untighten and comfortable to use. STR8JKT is featured on BOA and traditional lace models. BOA: Easy and quick - tightens with the flick of your wrist. Ortholite C2: Ortholite footbeds create a cooler, drier, healthier and better cushioned environment for your foot. It will not break down over time and will stay cushy and comfortable ride after ride.